At SAKAYA, visitors find a soothing environment where premium sake is celebrated and learning about its pleasures is paramount. Learn more about our store below. At SAKAYA, visitors will find a soothing environment where premium sake is celebrated and learning about it's pleasures is paramount. The shop's distinctively understated design, featuring simple cedar plank shelving that showcases the beauty of the sake bottles and trademark sugidama hanging in the window, beckons both sake lovers and the curious to enter and explore. Our credo is that sake is meant to be enjoyed and shared. With this in mind, our 100+ sake have been carefully selected to offer customers a wide variety of choices from unsung artisanal, small-production breweries (not available elsewhere) to classic favorites. As NYC's first and only shop dedicated to specializing in premium sake, we also pay special attention to constantly refreshing our inventory and to seeking out new brews for our customers to discover via our network of resources in the U.S. and Japan. Finally there is a place in New York City to browse, sample, ask questions, discuss, and immerse yourself in sake. 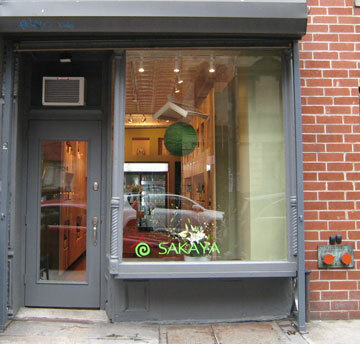 Please visit us and experience all that is sake at SAKAYA...we look forward to welcoming you!